Today I have two cards to share with you that I made for some challenges. 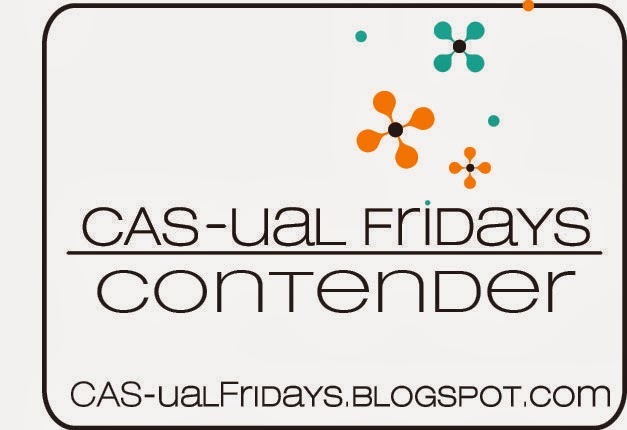 The first card is for CAS-ual Friday. I'm sorry to see that they are taking a little break, but I'm sure it is much needed and they will be back stronger than ever next year. They have a fun Tic Tac Toe game this week and I choose the top row - Chevrons, Black and Sequins. I used washi tape and the great Lawn Fawn Hello die and some Lawn Fawn sequins to make my bright happy card! I used the PTI coverplate diagonals and inlaid strips in the colors of the rainbow. I couldn't decide what color to stamp the sentiment, so my 11 year old daughter suggested a rainbow of colors! I thought it was a great idea and it turned out really cute! Have you played in any challenges this week? 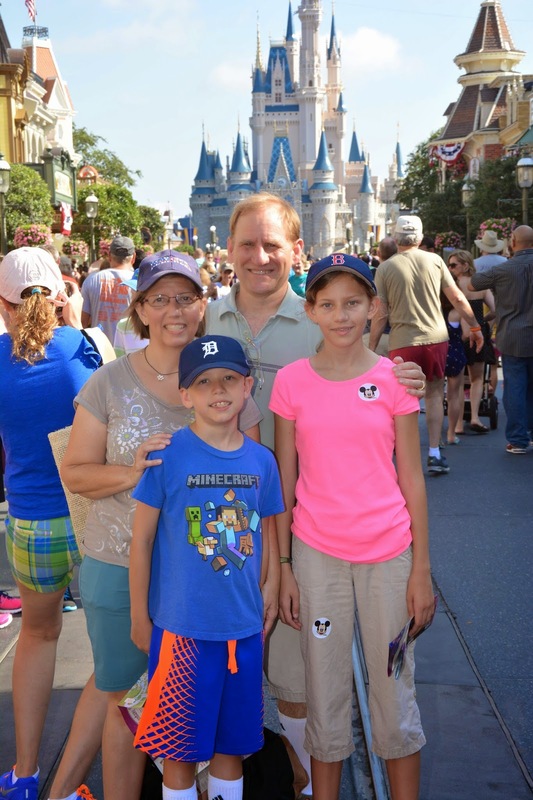 I just got back from a fabulous vacation in Disney World with the family. We had such a great time even in spite of the HEAT!! Being from the Pacific Northwest, we aren't used to such hot weather and humidity, but we didn't let that get us down! We visited all of the Disney Parks and spent one day at a Disney water park! I think everyone loved that day the best, since we didn't feel so hot and sticky all day. There were some thunderstorms while we were there, and we even got caught in one trying to catch the tram that takes you back to your car in those huge parking lots. It was raining so hard, we were soaked by the time we got to the car, literally dripping wet from head to toe! It was so crazy we had to laugh! 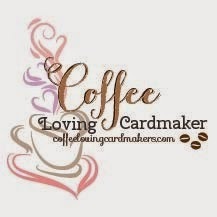 I am excited to get back to making cards again! My friend Amy invited me to a Stamp Camp, so I was able to be a little crafty today and get some creativity flowing again! Hopefully I will be making more cards next week once I'm done with my mountain of laundry! Hero Arts is having a great challenge over on their blog - to create a one layer card! I have two cards to share today that I am entering in their challenge. On the first card I white embossed the Leafy Vines background stamp and then added some distress ink with my waterbrush over the top. I love the emboss resist technique. It's like magic when the image appears! I used salty ocean, broken china, peacock feathers and mowed lawn distress inks. I really like the softness of the card. I debated adding some sequins, but finally decided against it. What do you think? Would it be better with them? My second card uses a technique I saw on the wonderful Jennifer McGuire's blog. 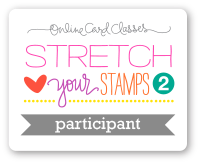 You stamp your image in white ink on kraft cardstock, then color over it with pigment inks. The colored inks are vibrant and soft at the same time. (is that possible?) I white embossed the greeting from the HA set Made with Love. The small flower images are the 'extras' in a friendship greeting set I got at Micheals. I colored over the white ink with colorbox pigment inks using a Fantastix. A simple twine bow finished off the card. I really like the way it turned out and I will be using this technique again! 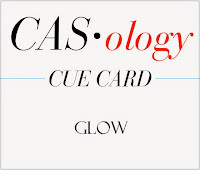 The cue card over at CASology this week is GLOW. I remember when I was a kid, my sister and I would love catching fireflies in jars and watching them glow. So I tried to recreate that idea with my card. I used the HA Love Jar set and sponged some yellow to make it look like it was glowing. Then I added some fireflies (or do you call them lightning bugs?) with yellow rear-ends! I pieced together some Paper Smooches sentiments to create my "Way to glow" and embossed it in yellow. Thanks for bringing back some great memories! I am playing along with Poppy Sketches again. 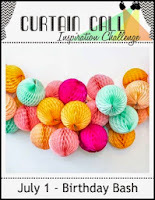 This is such a fun challenge - I love the sketches and the 'pop' of color! When I saw the sketch this week, I knew exactly what I wanted to do. I have this wonderful butterfly die cut from Memory Box, where the die only cuts out the wings and leaves the middle of the butterfly attached! There is another die for the body of the butterfly, which you can add if you want. The wonderful Julie Ebersole introduced me to this great die when I took a live class from her last month! 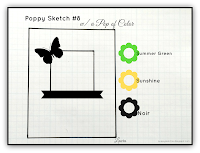 With some creative masking I used my mini ink blending tool to add yellow to the butterfly and green to the square. The HA sentiment was heat embossed in white. The card turned out almost exactly like what I had pictured in my head - that rarely happens with me! 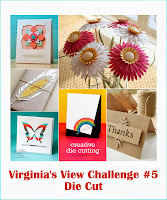 I am also submitting this to Virginia's View Challenge which is all about die cuts this month. 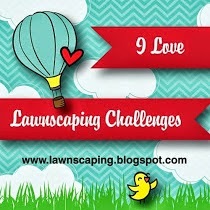 Have you seen her new challenge blog? It is amazing, with wonderful guests and lots of inspiration. I really like the wrap up she does at the end of each challenge. So informative! I have two cards to share today. 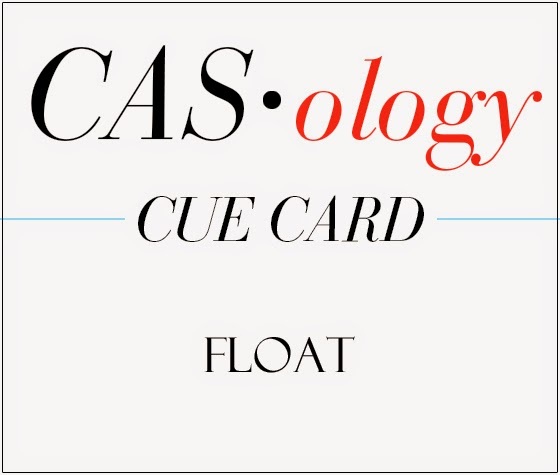 The first one is for the CASology cue card 'float'. I searched through my stamps for a boat stamp and couldn't believe that I didn't have one, so I decided to make my own! I used the Wplus9 triangle stamps to form my own little floating boat! I watercolored the little lake with some salty ocean distress ink and water. The boat color is HA orange soda and the sail is butter bar. I think it turned out pretty cute considering I didn't have a boat stamp! My second card is for the Curtain Call Challenge Birthday Bash. I loved the colors in the inspiration photo, and used PTI's circle scribbles stamp set. The sentiment is Paper Smooches and I added some Lawn Fawn sequins that matched the ink colors of HA tide pool and butter bar, and SU melon mambo and regal rose. Thanks for looking and hope you have a fantastic 4th of July!